Choosing a mattress should be a personal experience if you care about the quality of sleep you’re going to get. It doesn’t have to be rocket science, but you need to know yourself, your likes and preferences in order to get it right. 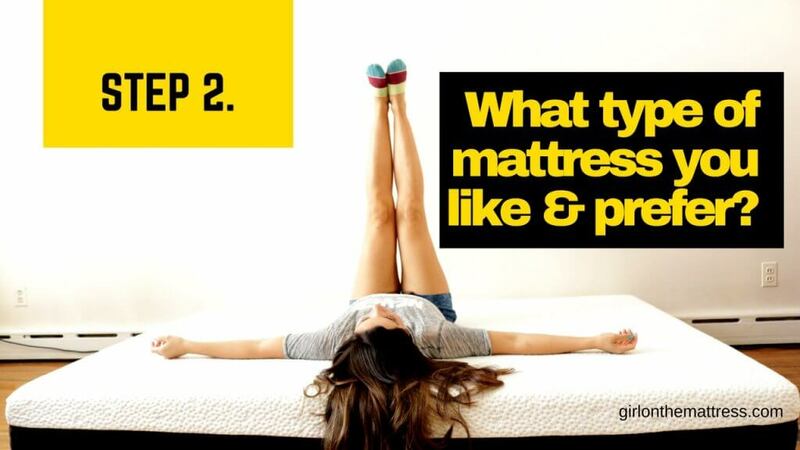 It also helps if you learn a bit more about the materials used in the mattress to see if it’s the right one you need. 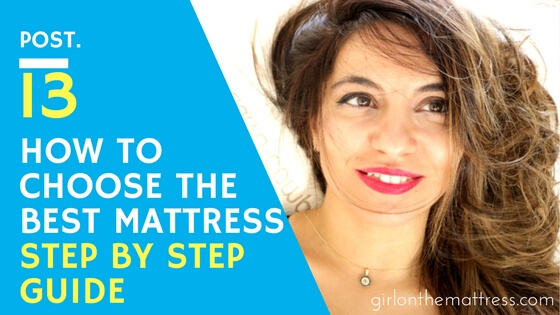 In this article, I’ll help you pick the best mattress in five simple steps. Are your ready to find your mattress? Related read: Find out the advantages and disadvantages of buying your mattress in a store vs online. Step 1. Do You Even Need to Replace Your Mattress? Step 2. What Options Do You Have? Mattresses come in all sizes and form. They’re also made from different materials. It’s a good idea to familiarize yourself on the most popular type of materials and what their strengths and weaknesses are to find what’s suitable for you. Foam has several types; you have latex and memory foam as the most prominent. There are some brands that create their own specific foam, varying the densities and firmness to accommodate different types of sleepers. It’s ideal for sleepers who want to keep cool throughout the night and require a degree of bounce. Latex is great for those who adore foam mattresses but hate the feeling of extreme hug that memory foam offers. Memory foams were treated like wonder foam for some time. And it’s no surprise because they are excellent at providing support and relief from pressure. Remember, there is a huge selection of memory foams from different brands and these are often tweaked according to certain preferences. So the term memory foam and its performance will vary per company or brand. Generally, these are great for sleepers who want a pronounced hug. These are updated versions of the old spring mattresses you likely slept in when you were younger. These mattresses contain steel springs to provide great comfort and bounce. Generally, the more coils included, the better the support. Coil or innerspring mattresses are great for those looking for a good amount of bounce and comfort. Cooling is also excellent on these mattresses as well as edge support. As its name suggests, these are mattresses made from different or a combination of foams or innersprings. They combine the best of both worlds, so to speak. These hybrid mattresses address different issues lacking in one particular material. It can be a hit or miss combination but when it’s done right, you do get the best of the best. Ideal for all around sleepers. Hybrid mattresses are often made to accommodate different types of sleepers, making it an excellent choice. 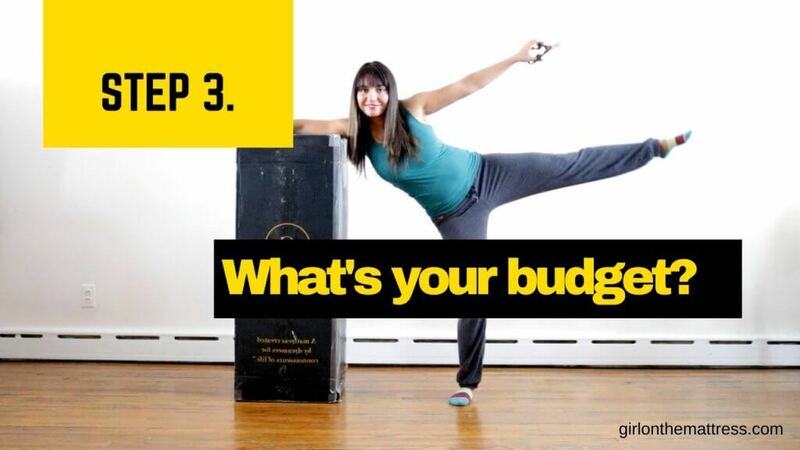 With so much competition, it’s not difficult to find a mattress that fits your budget. However, the tough part is finding the best mattress for you with the budget you have. Just keep in mind that the higher the price doesn’t mean the mattress is of better quality. If you want to have a bigger mattress, like a King or Cal King, then maybe create a $1000 to $1500 budget. A quality mattress is a great investment because if treated right, they can last more than 10 years. There are plenty of great deals out there and make sure to read up on as many mattress reviews as possible while you’re shopping around. Step 4. 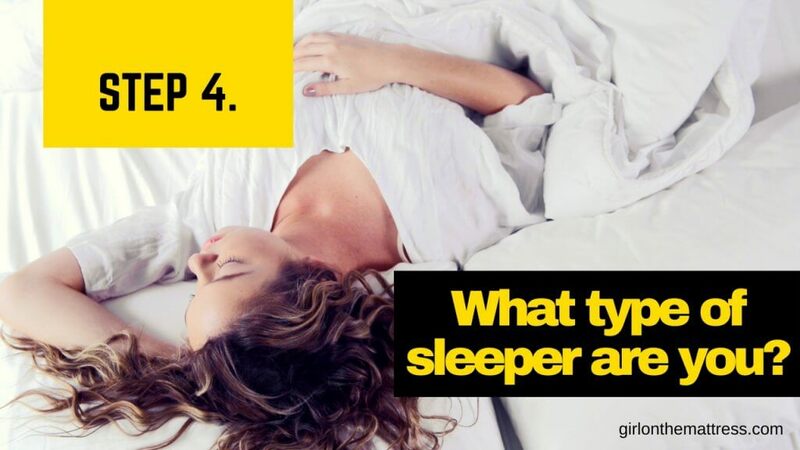 What Type of Sleeper Are You? 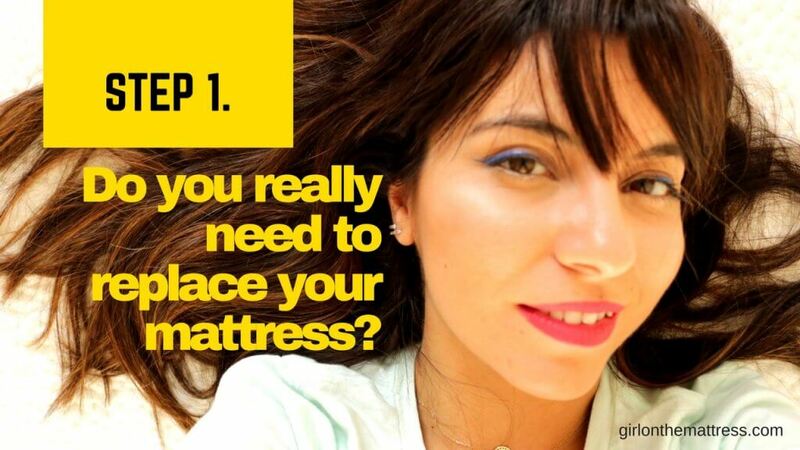 This is important because it will affect how you feel with your new mattress. Take time to find out if you’re a side, back or stomach sleeper. Which areas you prefer sleeping on the mattress, like do you always hover in the center or do you tend to move towards the edge? Also find out what kind of firmness level you’re most comfortable with. Mattresses these days can offer different specific options including the firmness levels so it’s a good idea to know all these before hand. Also take note of your weight. Remember, some mattresses allow heavier people to sink a lot more deeper than average, thus creating a completely different feel. Don’t rush it. Unless you really need a mattress ASAP, it’s best to take your time in shopping around for the best mattress for you. Read up on online mattress reviews (you can find a lot here at my site), compare prices, and if you want to take the next step, order and give the mattress a try. Most mattress companies offer a decent trial period so you can try the mattress of your choice to see if it addresses your issues. If you have a sleep tracker like this one, you can track and compare your sleep quality with your new mattress that you’re giving a try. Before you leave, definitely check my video below 🙂 If you have any mattress related questions or feedback, shoot me an email.